Six members meet at Waterloo International for the 06:53 WIT -Brussels Midi, with a 6 minute late arrival into Brussels we made the loco hauled 10:52 Brussels Midi (Ex Oostende) - Köln with a few minutes to spare, an on time arrival in Köln meant we caught the through train (14:09) to Dresden instead of the connection via Berlin on the 15:09. So we arrived in Dresden at 22:05. Three members went to the Pension used last year on our return from the Czech Republic. Two others and myself were using the IBIS hotel in the City Centre. The only member missing was Tom Chaffin; I had received several messages by text during the day, Tom had been stuck in Heathrow and delayed for some eight hours due to another breakdown of the National Air Traffic Control computers at Swanwick. Eventually Tom arrived at Dresden Flughafen (after having to pressurise Lufthansa to allow him to depart the UK that day and be placed on a standby list for the flight from Frankfurt to Dresden) to be greeted by our German member Rainer Schulenburg, who had earlier meet us and taken those staying at the Pension by car to their resting place. 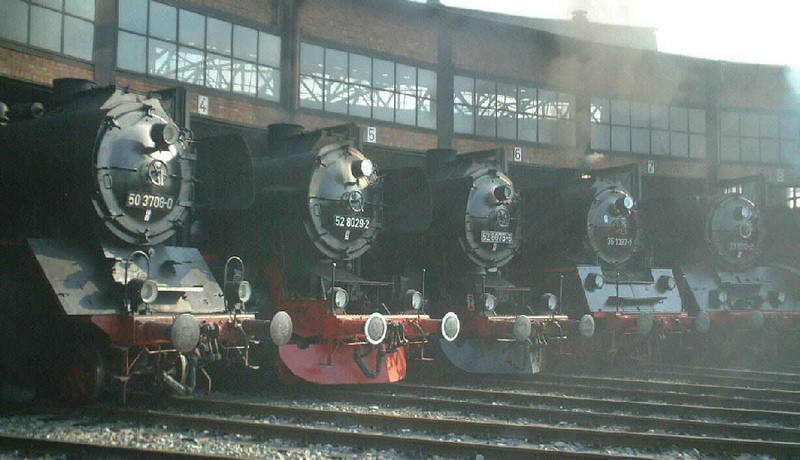 Early rise so that 4 members could visit Radebeul for the NG to Radeburg but only as far as the crossover point so that we bagged two 99's and get back to Dresden for the 50 trip to Altenberg. So using Gnter's battle bus (Gnter is one of my friends from Eisenach, and his mini bus is the class 52 8075 Battle Bus). Gnter spoke with the Driver of 99 1798 and myself and Tom rode the footplate to Moritzberg, members Tipping and Kingston riding the return on 99 1799 to Radebeul, then by S-Bahn back to Dresden HbF. After a light Lunch, of Bratwurst mit Brot, we took another S-Bahn out to Dresden Plauen to view the Depot, whilst at Plauen Station 52 138 ran through light to the Steam Depot. Then back to Dresden HbF for our first of two steam trips over the next two days. 50 3648 was to be a stead from Dresden HbF - Altenberg. Until about 70 years ago this branch off the Dresden - Děčín mainline was 750mm gauge. What a wonderful line this is, climbing high into the countryside above Dresden towards the Czech Border, with steep gradients and spectacular scenery, we reached the tin Mining town of Altenberg where a two-hour stop was made for engine and passenger refreshment. After a return run to Dresden Plauen we visited the depot and managed some filming, including the close of operation for the day at 18:00 with the usual whistle blowing from all those assembled steam locos. After a run back to our Hotels in the Battle Bus, we returned to Plauen later for a group party, joined now by a Swiss member Gnter Otto (German Member actually, but living is Switzerland). So with eight members and four possible new members (the Eisenach Crew of 52 8075), we took over the "De Schachtel" pub, which is dedicated to railways – complete with model trains chugging around the ceiling. Great food (plenty of it) and with a great atmosphere and crowd, a good night was had by all. Afterwards a small group of us then risked the City Tour in the Battle Bus. Another early start, so that we could get to Freital-Hainsberg for the 09:00 to Kipsdorf, we had decided again to do the trip to the crossover point, in this case Dippoldiswalde. So with 99 1747 at the helm, and again on the footplate, changing over to 99 734 at Dippoldiswalde we arrived back at Freital, a trip over the old line (now Freight only) to Potschappel was taken with 99 1713 and return before we headed back to Plauen for a quick depot visit, before out trip behind StarLok 18 201 to Decin in the Czech Republic, with Steam ships on the river blowing their whistles and 18 201 hers it was a magnificent trip. After another wonderful day we finished off with a meal at the IBIS. Homeward bound, via Berlin to Köln then Thayls to Brussels Midi then the 19:56 Eurostar to London. Only three members on the return from Köln , as myself and another member stayed on for an extra day and return on the Tuesday. One member stayed in Dresden and Tom Chaffin flew back, this time with no delays.